There is something so comforting about chocolate pudding. Maybe it's the combination of chocolate and cream or maybe it's the fact that when you have pudding you're someplace where you can slowly enjoy every chocolatey spoonful. Last night L., and I had a friend over. 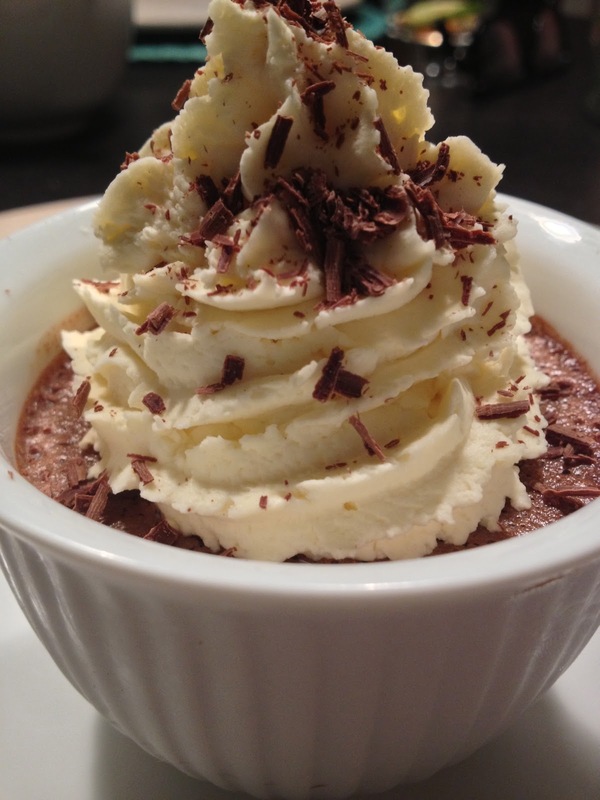 When I first planned the menu I was going with apple crumble for dessert but when I found out our guest was gluten-free I found a recipe for Chocolate Pots de Creme from Bon Appetit. It's a bit of work but from the happy looks on their faces last night, this recipe was worth every moment. From all of us here at The Happygirl, we wish you unbounded moments of happy on this Valentine's Day! Prepare six standard custard cups in a jelly pan with at least 2 inch high sides. Set aside. In a saucepan over medium heat bring the whipping cream to a simmer. Add the chocolate and stir just until incorporated. Remove from heat. In a bowl, whisk 6 egg yolks with sugar. Whisk until the sugar is incorporated into the eggs. Slowly add the chocolate cream to the egg/sugar mixture, stirring as you pour. Once incorporated, strain the batter into another bowl. Let mixture cool ten minutes. Pour custard evenly into the six ramekins, leaving at least one inch at the top. Cover each ramekin with aluminum foil. The ramekins should be in the baking pan. Pour water into baking pan about 1/3 of the way up the custard cups. Carefully place pan in oven to bake for 60 minutes. When done, remove ramekins from water and place in refrigerator to cool at least 3 hours until set. In the meantime, prepare orange cream by whipping one pint of heavy whipping cream with 1 teaspoon of orange oil and 2 tablespoons of powdered sugar. Whip until light and fluffy. Serve by adding a dollop of orange cream to each ramekin.